Delight in beachfront Shipwatch Surf and Yacht Club, for relaxation, for boating, for pure enjoyment. This unique property is located on 500 FT of beach front and also offers old river access across the street. These spacious condos boost a Southern Living, cottage atmosphere. 1184 SF and beautifully furnished with ceramic tile throughout. Electronics include 32" HDTV, DVD in Living Room, 24" TV, DVD in Master Bedroom and 17" Flat Screen TV, VCR in Guest Bedroom. The staff is wonderful to work with. They go above and beyond to make your stay great. Thank you for being so thoughtful about our daughter's honeymoon. The basket you took them was great. She was so excited. Also, thank you for working with us so patiently as we had to change our reservations due to my mom's health. We will definitely stay with you again! The staff at Perdido Realty are always friendly and efficient. I have dealt with them for many years and never had a bad experience. We have been renting from Perdido Realty since they had their office in the little house on the beach. Always accomadating and friendly. We have never had a problem with our rental and have even been given advise about weather it would be a good fit for us or not. We enjoyed Shipwatch because it was so quiet. Team members were great and very helpful. We have been coming back to ShipWatch for 30+ years. Hope to keep coming. D804 King was great! Overall it was good like always...we love ShipWatch! Thank you! You were friendly and efficient. I love booking through Perdido Realty! 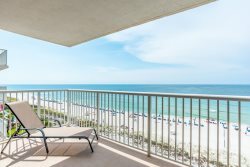 Perdido Key is our favorite place to visit and we have stayed several times and each time we have booked through Perdido Realty. We have never been disappointed. The rental process is simple and the check-in, check-out process is simple and stress-free. Shipwatch is my go-to place to stay in Perdido. We love how quiet and well cared for the property is.